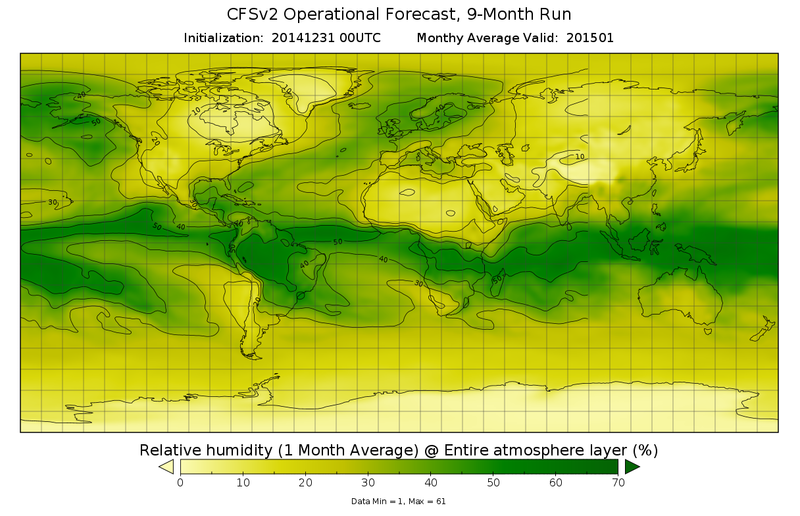 CFSv2 9-month run forecast of relative humidity (%) as 1-month average for entire atmosphere layer. The Climate Forecast System Version 2 (CFSv2) produced by the NOAA National Centers for Environmental Prediction (NCEP) is a fully coupled model representing the interaction between the Earth's oceans, land and atmosphere. The four-times-daily, 9-month control runs, consist of all 6-hourly forecasts, and the monthly means and variable time-series (all variables). The CFSv2 outputs include: 2-D Energetics (EGY); 2-D Surface and Radiative Fluxes (FLX); 3-D Pressure Level Data (PGB); 3-D Isentropic Level Data (IPV); 3-D Ocean Data (OCN); Low-resolution output (GRBLOW); Dumps (DMP); and High- and Low-resolution Initial Conditions (HIC and LIC). The monthly CDAS variable timeseries includes all variables. The CFSv2 period of record begins on April 1, 2011 and continues onward. CFS output is in GRIB-2 file format. Data and metadata access for the dataset using OPeNDAP, WMS, WCS, HTTP, and other data access protocols. Direct download for files via HTTP. Coverage Description Global coverage for CFSv2 Forecasts. General information and access links for the dataset. Journal of Climate (J. Climate) article landing page. Data Presentation Form Digital model - multi-dimensional digital representation of a feature, process, etc. Purpose The operational implementation of the CFSv2 Forecasts ensures a continuity of the climate record and provides a valuable up-to-date dataset to study many aspects of predictability on the seasonal and sub-seasonal scales. These real-time operational forecasts will be used by a wide community of users in their decision making processes in areas such as water management for rivers and agriculture, transportation, energy use by utilities, wind and other sustainable energy, and seasonal prediction of the hurricane season. Lineage Statement CFSv2 outputs were produced by the NOAA National Centers for Environmental Prediction (NCEP) and are archived at the NOAA National Centers for Environmental Information (NCEI).